Traditional stormwater drainage methods that rapidly convey runoff from where it has fallen to a soakaway or watercourse increases the risks of flooding and environmental damage. The “Stormwater Treatment Train” is a collective strategy that uses an integrated approach of several components – such as LID tree pits – that slow, cool, treat, transpire, and infiltrate stormwater rather than discharging it into the storm sewer system as quickly as possible. This article looks at how landscape architects and civil engineers can implement the stormwater treatment train to rise to the challenge of sustainable stormwater management. This year’s CitiesAlive Conference was about “rising to the stormwater challenge”, highlighting the advancement in research and policy related to stormwater management. And there’s no better host city than Washington, DC. The District of Columbia is a leader in green infrastructure policy and implementation, due largely to the Chesapeake Bay environmental issues caused by the uncontrolled stormwater runoff. The education sessions explored the science behind sustainable urban drainage and the steps that are being taken to reduce dependance on grey stormwater infrastructure in DC and elsewhere. Focusing on new and innovative technologies that are enabling designers to meet increasing municipal stormwater requirements, the “Stormwater Technical Workshop” provided civil engineers, landscape architects, building owners, and policy makers with a solid technical grounding in how LID stormwater management techniques are able to effectively and economically manage runoff at the source. Industry experts from the private and public sectors, as well as university researchers, presented the science and engineering standards associated with various LID practices emphasizing how these systems can be designed to maximize stormwater retention as close to the source as possible. 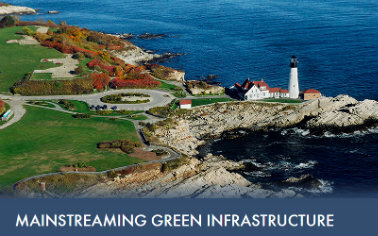 Stormwater policies from a variety of jurisdictions were presented, as well as the factors that contribute to the costs versus benefits of various stormwater best management practices (BMPs). While LID tree pit design is already recognized as a stormwater BMP in some jurisdictions, they are most effective when formed as part of a stormwater “treatment train”. The treatment train is a collective strategy that uses an integrated approach of several components that slow, cool, treat, transpire, and infiltrate stormwater rather than discharging it into the storm sewer system as quickly as possible. It can include green roofs, green walls, bioswales, permeable paving, rain gardens, and tree pits. The “treatment train” is a collective strategy that uses an integrated approach of several components that slow, cool, treat, transpire, and infiltrate stormwater rather than discharging it into the storm sewer system as quickly as possible. Subject matter experts from the design, policy, and manufacturing sectors took part in a panel discussion entitled “The Treatment Train: Integrated Design Practices for Stormwater Management”. This panel of experts deliberated on the synergies that combining these technologies can bring to various projects. GreenBlue Urban’s very own Jeremy Bailey was privileged with an invitation to join the panel, where he discussed techniques for integrating tree pits into stormwater design as a sustainable way of managing stormwater at the source to reduce runoff loads on sewers and bodies of water. The below video shows GreenBlue Urban’s introduction into the panel. As the bottom of the sustainable stormwater management process, or the caboose of the treatment train, street trees offer a last chance opportunity to prevent stormwater discharge into the sewer system. Healthy urban trees with established root systems can significantly reduce the amount of stormwater runoff when stormwater runoff is integrated into the design of the tree pits, whether by permeable surfaces, linear drains, or otherwise. The below illustration visualizes how LID tree pits work. It is a known fact that a large mature tree can consume up to 50 gallons of stormwater, or even more, per day through root takeup. Filtering stormwater runoff through a tree pit also removes total suspended solids, phosphates, nutrients, hydrocarbons, and other pollutants ensuring that the excess water draining from the base of the tree pit is free of harmful chemicals and pollutants that are detrimental to our water bodies. In addition to the below ground benefits of LID tree pits, there are also significant above ground advantages such as stormwater alleviation from canopy collection, absorption, and evapotranspiration. As stormwater practitioners from cities and regions around the world come together in the design and implementation of low impact development, we will see a significant increase in sustainability. Understanding the “Treatment Train” concept and how it can benefit our urban areas is a large step in that direction.